I have had my worm composter about a month - worms arrived in excellent condition and within a couple of hours seemed at home. My problem, if it is one, started about 10 days ago - approximately 1/2 of the group are doing worm things in the composter and about a fist size of them are balling up. At first I thought they were feeding, and then realized that was not the case. I have called the company that makes the vermicomposter and they did not know the answer. I have spent alot of time looking for the answer - if I am doing something wrong, I would like to correct it sooner rather than later. The worms are being fed apples, pears, soaked egg cartons, leftover bread, plus much more (in the appropriate amounts). The compost appears to have the proper moisture level, and I am concerned that the ones in the ball are not eating, since each time I check them, there they are; the ball does not seem to be getting smaller, just crawling over each other. Help! I am very sorry to hear about your first experience with worm farming. Hang in there. It will get better! 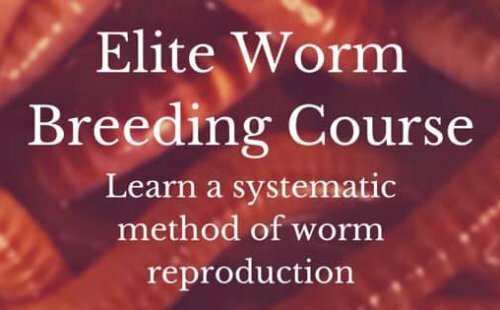 If your worms are balling up that means that they are trying to find safety among themselves because the conditions around them are not favorable. I do not know what type of bin you have or where you are keeping it but I'll go off of a couple of things you mentioned. You have had your worm bin for a month and then your problems started. This is common with beginner worm farmers. I was the same way and I failed the first time. I had overfed my worms. 1 month is just about the right time frame for things to go south like a snowball. You mentioned foods like apples, pears, and bread. All great foods but in moderation. You also mentioned egg cartons. Also great for carbon material and balancing the PH. I'm thinking your worms are being overfed and can't keep up with the food you are putting in as these are high in nitrogen and will turn sour. Keep a 20:1 C:N (Carbon to Nitrogen ratio) using things like coco coir (WONDERFUL for worms)or peat moss as a bedding and only put in a fist full of food until you see the worms eating it almost completely then it's time to add more. Do this for now. Save as many worms as you can by putting them in some damp peat moss or coco coir and start your bin all over again. First layer is peat or coir then fist full of food for 1 pound of worms. Not so much fruit. Put a little veggies in as well. Then for your third layer cover the food completely with peat or coir. Then use a damp newspaper and cover everything. Keep temps around 60- 75F, bedding damp as a squeezed sponge, and plenty of aeration. With all that said, let's hope you don't have a pest problem but that's another problem for later. Thank you for your response - before I received your reply, I had already done what you suggested, with a twist. I painstakingly sorted through the compost pile to locate as many worms as possible (about 2 hours worth of sorting), and I knew that I would be losing any eggs and small ones, so after sorting I dumped the contents into a large pan and set it aside. Surprisingly, there was very little actual food that I took out and the other things - cardboard, egg cartons, etc were broken down really well - so lots of evidence that they had been at work! Then, I started over with a new tray, new bedding, everything and put in the sorted worms. That's when things got really interesting. I was checking on them every 3 - 4 hours and its a good thing! They were crawling out - into the bottom collection tray and out the top, down the side and onto my kitchen floor! Had my own little worm parade going on. After gathering them up for a second time, I decided more drastic measures were called for and uncovered them, set the tray on several layers of newspapers and taped it around the bottom. Then I placed a lighted desk lamp shining down onto the tray to discourage them from crawling out the top and to move into the new bedding. When it was time to go to bed and shut off the light, I put the lid back on, and TAPED IT SHUT with blue painting tape! It worked! In the morning after removing the tape from the lid and the newspaper from the bottom, no worms were where they were not supposed to be. Then, the decision as to what to do with the contents of the original tray. Since it did not appear that it was a problem of overfeeding, I decided that maybe the worms needed more room so I took the first tray (that had been washed out) and put in new paper on the inside bottom, moistened the original contents since some of it appeared dry, and dumped everything into the tray. Good thing, as there were several worms in the bedding. Now, I felt I had saved any babies, any eggs, and the worms I could see. I put this under the new tray, and tada! the next morning, no escapees, and some of the worms from the top tray had moved into the bottom tray. Thank you for having this website and sorry about the length, but maybe my situation will help someone else. No More Worms Balling Up Congratulations! That is wonderful news Mr/s Anonymous! I knew things would work out for you. sometimes it takes a while for worms to get adjusted to their new environment. You should be able to remove the light when you know they have been completely adjusted. The dry air is enough to keep them inside the worm bin as long as conditions remain favorable. You mentioned the tape (not necessarily a bad thing for short term solutions) but make sure they are getting plenty of air. This will increase food decomposition with the microbes and allow the worms to breathe. Thank you for posting your questions and indeed people will benefit from your experience. This helped a lot, I am not a worm farmer but recently I found a HUGE ball of worms at my school. I got my friend and we started moving them. I knew we were doing the right thing. Now I am sure. The place I found them is near a place of sandish dirt near a fence near the school field. Worms Balling Up Thank You! You're very welcome. Hopefully you found some composting worms and you can put them to good use.